This Irish Christmas ornament trinket box features a metal hinge. 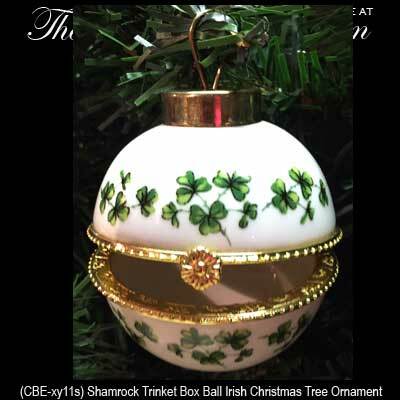 This shamrock Christmas ornament could serve double duty as a jewelry box for a special present such as a Claddagh ring. The Irish jewelry box features green shamrocks all over the white porcelain that is enhanced with gold tone metal accenting. The Irish Christmas ornament is ready to hang from its metal loop and it measures 2 1/4" wide x 3 3/4" tall. This Irish Christmas jewelry box is gift boxed with a shamrock history card, complements of The Irish Gift House.